Serena Williams Glam Slam Set! This post is extremely over due. I picked up the Serena Williams Glam Slam set about 4 months ago, right when it came out and was completely obsessed over the summer. I experimented with so many different polish combinations, and some of them I have already posted but I never posted the two polishes together. After swatching the Julep colors and being some what disappointed with the outcome I reached for the Serena Williams again. The Julep silver and glitter reminded me of the Glam Slam set but the Julep was basically a dull and lifeless version of the Serena Williams combo. After being so let down I knew I had to give myself the Serena Williams manicure again. And after searching through my blog I realized I never posted pictures of the two together, so here ya go! OPI “Your Royal Shine-ness”. This silver foil is my go to silver polish in my collection. It seems so crisp and clean but bright at the same time and the fact that you get this awesome of a finish with 2 coats is amazing. This polish jumps off my nails and was a staple for me in the summer. This will also be a staple around the holidays because this just screams Christmas to me. I just love how the light hits this polish and it is so shiny it almost has a mirror type finish. This is so much better than the Julep silver for my Julep Mavens box. To see a swatch, check out my October Julep Mavens post. 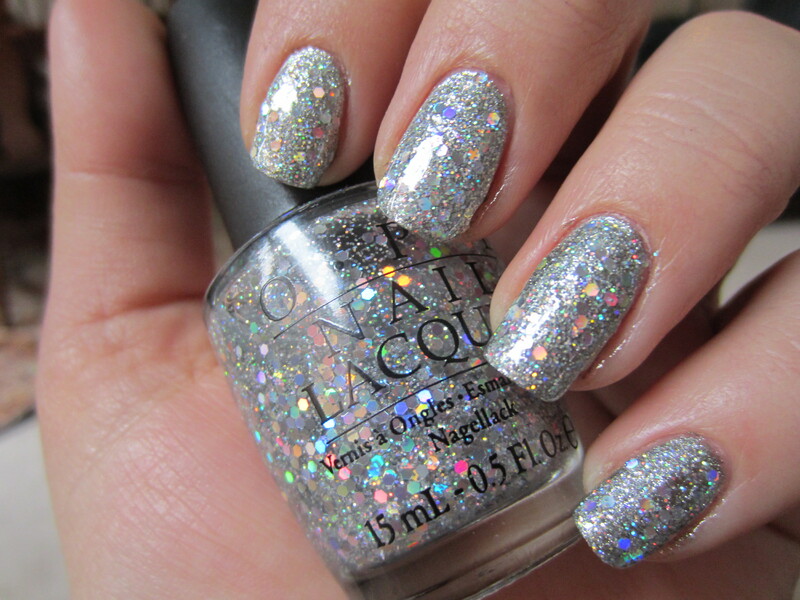 OPI “Servin Up Sparkle”. This chunky holographic glitter is absolutely amazing. This is just one coat over Your Royal Shine-ness and this combination seriously is like diamonds. Servin up Sparkle is a densely packed silver glitter with huge pieces of hexagonal holographic glitter. It is every glitter lovers dream and I wish I had a backup bottle so I could play with it more. Overall, this is one of my favorite polish combos, and I rarely use one polish without the other. If you can get your hands on this set, don’t even hesitate. If you can’t, China Glaze has a similar silver (although I can’t comment on the formula) and Icing has a glitter that is similar (more holographic glitter and no silver glitter). But I feel like I have diamonds on my hands when I wear these polishes, and I guess until I can get my boyfriend to put some real bling on these fingers these polishes will do. I got grape set match and serving up sparkle just recently at Ulta, and I don’t think my serving up sparkle is quite as dense as yours. I’ve heard that there are 2 formulas of that color and I’m thinking I got the sparse one. 😦 After seeing your pictures I’m thinking I should get the royal shineness/serving up sparkle combo as well. Hrmmm… decisions, decisions. haha. The purple of grape set match is awesome! Do you have it?